Gulmorod Khalimov is shown in an undated photo from a U.S. State Department poster obtained Aug. 30, 2016. Gulmurod Khalimov, a former Tajik military officer who is now the Islamic State group's chief recruiter, has become one of the world's most wanted terrorists. The United States is offering a $3 million reward for his capture. Khalimov, 41, a former Tajik special forces colonel who trained in the U.S. and Russia, is now head of armed units and in charge of military operations for IS, according to Western intelligence reports. After an airstrike last week killed Islamic State's Abu Mohammed al-Adnani, analysts said Khalimov was elevated to serve as second in command to the overall IS leader, Abu Bakr al-Baghdadi. "This further highlights the Islamic State's leadership wishes for the group to be perceived as an entity in which people from anywhere in the world may fill important roles," said Michael S. Smith, a counterterrorism adviser to members of the U.S. Congress. This poster obtained Aug. 30, 2016, from the U.S. State Department shows Gulmorod Khalimov. The United States slapped a $3 million bounty on the former Tajik special operations commander who received American training but later defected to the Islamic State extremist group. Khalimov, who is believed to operate from Syria, is driven by a radical Muslim ideology, analysts say. "In one of his video messages he blamed Tajik officials for suppressing religious freedoms, forcing Muslim men to shave their beards and removing veils from women's heads," Esfandiar Adineh, an analyst based in Dushanbe, told VOA. New focus on Central Asia? The Tajik commander's increasingly visible role could expand IS operations beyond Syria and Iraq, experts say. "With his capabilities and trainings, combined with increased pressure on IS in the Middle East, there is a faint possibility that he may look more toward creating problems in Central Asia in a desperate attempt to remain relevant," said Ethan Wilensky Lanford, an expert on Countering Violent Extremism at Rice University in Houston, Texas. Central Asia has proven to be fertile recruiting ground for IS, whose ranks now include thousands of Asian fighters in Iraq and Syria. Russia has long been aware of the IS recruitment process, and worries that a stronger IS presence in Central Asia would be a growing threat to Russian national security. "His promotion is also strategically valuable as this can bolster [IS] foreign recruitment efforts," Smith said of Khalimov. He is said to be the organizer of a radical group known as the Cyrillic Jihadists — Russian speakers who come from the former Soviet republics. "These fighters are very different from others in terms of discipline and military training, compared to their Arab and African counterparts," said Salem al-Hammoud, an activist who fled to Turkey from the IS-controlled Syrian city of Deir Ezzor. Islamic State's leaders appoint the Central Asians to important posts, Hammoud says, "because they are tough and they do not sympathize with locals." And since they do not mingle with other jihadists, he added, IS leaders view them as "a very reliable, resilient force." Khalimov is believed to be directing IS recruiting operations from Syria, analysts say. An IS fighter from Turkey, Rashid Tugral, died in a battle in August, the extremist group said. In a diary he kept, which has been obtained by VOA, Tugral recalled that Khalimov interviewed him in Raqqa before he was accepted into Islamic State. "Most of jihadists were from Central Asia, so Khalimov asked most of his questions either in Russian or Tajiki [Dari]," Tugral wrote. 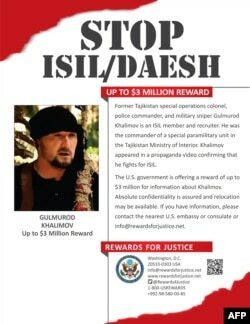 A highly trained veteran of Tajik government operations, Khalimov disappeared from Tajikistan in late April 2015 and reappeared a month later in an IS video slamming Russia and the U.S. His disdain for Americans and the West, he said, developed as a result of five counterterrorism training courses he took in the United States and Tajikistan, sponsored by the U.S. State Department's Diplomatic Security and Anti-Terrorism Assistance program. "Listen, you American pigs," Khalimov said in Russian in the IS video. "I've been to the U.S. three times. I saw how you train soldiers to surround, attack and kill Muslims, in order to eradicate Islam." The U.S. accepted Khalimov and other members of his unit for training between 2003 and 2014, at the recommendation of Tajikistan's government. A retired Tajik military officer who knew Khalimov told VOA "he was a very smart officer with a very good education in law," but upon returning to Tajikistan, he became a vocal critic of both his own government and the U.S.
At first, Tajik leaders were stunned at his turnabout. "We were observing him and had an eye on him," the country's interior minister, Lieutenant-General Ramazan Rahimzadeh, said last year. No one expected "a family guy" with a senior position like Khalimov "to desert his job and family and seek his redemption by joining radical Muslim terrorists abroad," the general added. After an investigation that followed Khalimov's abrupt turnabout, Tajik authorities said last year that he was wanted for crimes including high treason and illegal participation in military actions abroad. According to Reuters, military officers in Tajikistan have received text messages on their mobile phones signed by Khalimov, in which he promised to "congratulate" them on the 25th anniversary of the country's independence — the former Soviet republic's transition to independent statehood as the USSR collapsed in 1991 — to be celebrated this week in Tashkent and throughout the Central Asian state. Editor's note: This story has been updated to correct the month in which Rashid Tugral was killed.